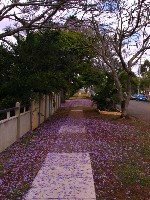 <-- jacaranda blossoms falling in Brisbane. This is what I'm reading at work while waiting for Lovergirl to have her eggs out. Inpatient suicides consisted of 7 females (30%) and 16 males (70%). Age of patients ranged from 23-74 years with a mean age of 40 years. The majority of patients were aged between 25-44 years of age (n=15, 65%). Over half of the patients had never been married (n=13, 57%), while approximately one quarter (n=6, 26%) of patients were either married or in a defacto relationship at the time of the incident. The two most common primary diagnoses were (1) schizophrenia and other psychotic disorders (n=10, 43%) and (2) mood disorders (n=10, 43%). In addition, approximately one quarter of patients (n=6, 26%) had a co-morbid mental health condition. The means of suicide included hanging (n=9, 39%), jumping from a height (n=6, 26%), jumping or lying before a moving train (n=3, 13%), overdose (n=2, 9%), drowning (n=2, 9%) and suffocation (n=1, 4%). I know I've said this before (ad nauseum), but I don't think I can do this work much longer. Remind me -- what kind of work is it? mental health - training, research,lobbying, policy development, sector development. just a bit soul destroying at times - so much world to change, so few successes.